4008 Restorer - A water-based, biodegradable cleaner used for soaking airbrush and spray-gun parts after painting. Partially dissolves dried paint allowing for easy clean-up with soap & water. Use as a soak for metallic parts: nozzle, needle, cup. Re-Usable. Keep in metal or ceramic container. Dissolves soft-plastics. Keep away from non-PTFE coated O-rings. Flush airbrush or spray-gun with water after using Restorer. 4030 Balancing Clear | Mix Additive - Mix additive that enhances spray performance, adhesion & coating durability for use when painting hard-surfaces, plastic and vinyl. Decreases drying times and allows the paint to air dry to a cured coating with improved film properties. High Performance Reducer works with Auto Air Colors, Wicked Colors and Illustration Colors. Precautions: Keep away from eyes. Keep out of reach of children. First Aid Treatment: If eye contact occurs, rinse with tap water for 5 - 10 minutes. If irritation persists, seek medical care. 5601 Transparent Base – Colorless resin base of Createx Airbrush Colors. 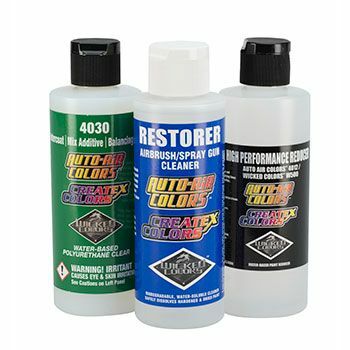 4008 Restorer – Removes dried paint from airbrush & spray-gun.